The $1,000 Peabody award check was presented by Peabody’s Angela Woolard to quilt show winner Roberta Tucker on behalf of Warsaw Community Church. 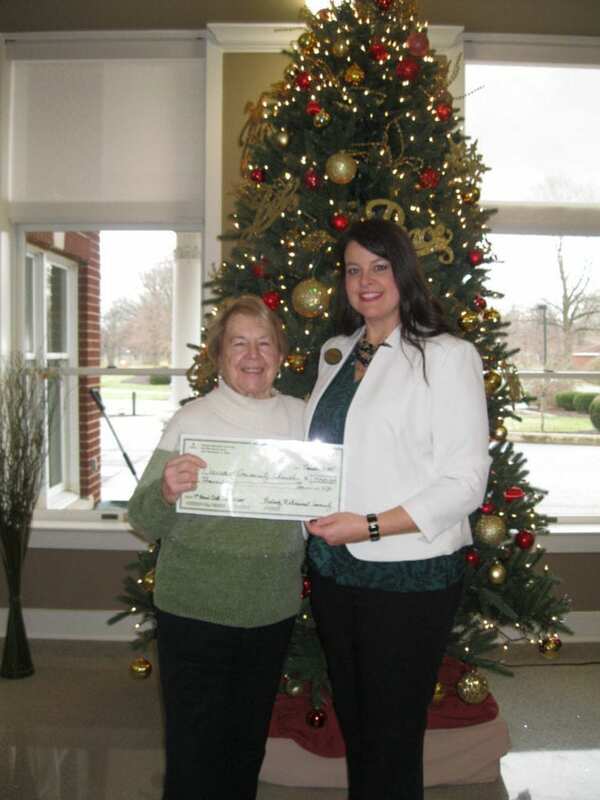 North Manchester, IN (January 9, 2018) – Peabody Retirement Community named the winner of their 4th Annual Peabody Quilt Show & Contest. A $1,000 prize was awarded to Warsaw Community Church for their winning quilt entry, Sweet Sixteen, created by Roberta Tucker. Tucker’s winning Sweet Sixteen lovingly stitched creation brought the promise of spring to Peabody’s quilt show. As temperatures dropped at the end of 2017, voters viewed the quilt entries while sipping hot cocoa and perhaps it’s not surprising they were drawn to the winning quilt. It features 16 beautifully appliqued spring and summer flowers—each one different from the next. “It’s a lovely quilt, and we were delighted to present the award to Roberta again this year. She attends Warsaw Community Church, including the Sunday school class taught by one of Peabody’s residents. She explained that the $1,000 award will help fund the church’s WCC Community Care Program. Money in the fund is carefully given to those in need,” Woolard says.